Home / Beauty of a Site Blog / Celebrate New Moon with DuWop's Twilight Lip Venom! Celebrate New Moon with DuWop's Twilight Lip Venom! Wanting to purchase Twilight Lip Venom? Click here. Learn more about it below! Vampire-inspired; Beauty of a Site-approved. This crimson, blood-red lip stain with a lip plumping bite will have you joining team Edward in no time. 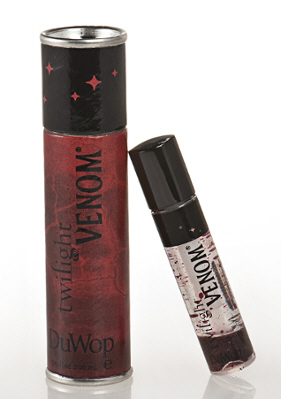 Help us celebrate the upcoming New Moon movie with DuWop's Twilight Lip Venom! [caption id="attachment_597" align="aligncenter" width="281" caption="DuWop Twilight Lip Venom"] [/caption] DuWop's popular Lip Venom acts as a plumping agent, using essential oils to increase blood circulation in your lips to add a plump and a flush of natural color. Inspired by the magic of the first Twilight Saga movie, DuWop created a new Twilight Lip Venom that, along with a killer bite for plumping and flushing, stains lips with a crimson color for added drama. Each tube of Twilight Lip Venom comes with the stain separated from the venom, but with a quick shake, the two formulas collide for the perfect stain & plumping partnership. Symbolic of the dramatic collision of the human and vampire worlds in the Twilight Saga, every application of Twilight Lip Venom helps transport you to a world of mystery, adventure & undying love. Click here to buy the Twilight Venom!